WESTLAKE, OH - The Ganley Auto Group has cut the ribbon on the brand new, state-of-the-art BMW of Westlake, a 42,000 square-foot facility that incorporates green technology throughout the building. The new BMW of Westlake store sits just off I-90 in Westlake at 24690 Sperry Drive. 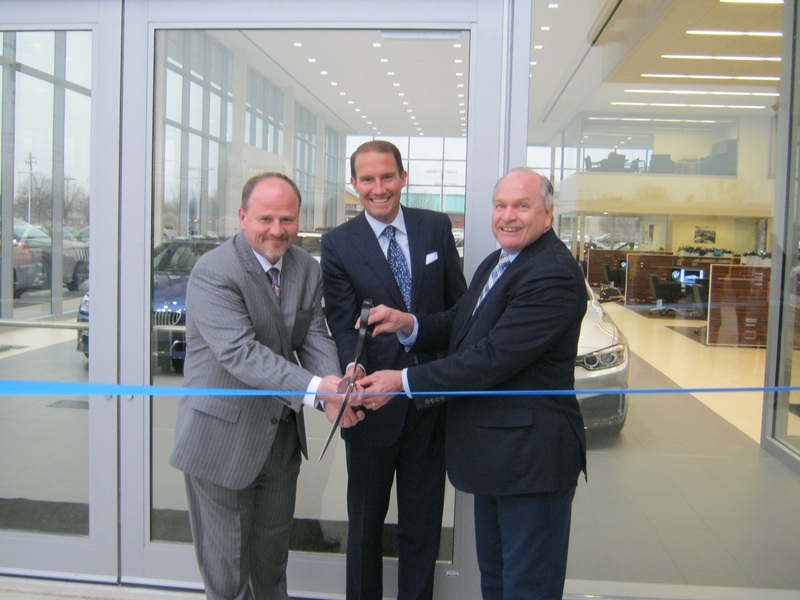 Adam Moon of BMW of Westlake (l to r), along with Ken Ganley of the Ganley Auto Group and Westlake Mayor Dennis Clough cut the ribbon on the new store. The ribbon-cutting ceremony on Tuesday, December 9th, was attended by the City of Westlake Mayor Dennis Clough among other dignitaries. The dealership will sell three BMW brands, which include the electric “i” brand’s i3 and i8, the high performance M brand and the upscale BMW Alpina brand. Out in front, there is a charger for electric vehicles that can be used by the i3, i8, or even vehicles like the Chevy Volt or Nissan Leaf. Inside, the store features a two-story open and airy showroom that can house virtually all of the BMW product line as well as an area that explains the “i” line. Decked out in white with dark bamboo antique wood accents, the showroom has an area with stations that feature large high definition screens where advisors can help the dealership’s clients customize new vehicles. To the east of the store sits a two-lane drive-in with a heated service reception area that can accommodate more than 16 vehicles. Service advisors offices are just a few steps inside. The state-of-the-art service facility has 16 service bays and 12 in-floor service lifts as well as a Hunter computer frame alignment machine. Located just beyond the service advisor area is a modern customer lounge as well as a parts department. The west side of the store features a separate showroom for the BMW high performance M brand. Just to the north of the M showroom, there is an indoor vehicle delivery area capable of handling two cars at once. It also has an exhaust vent so advisors can go through all the features of a vehicle as it is being delivered. The dealership will sell predominantly new BMW vehicles as well as about ten percent certified pre-owned vehicles. 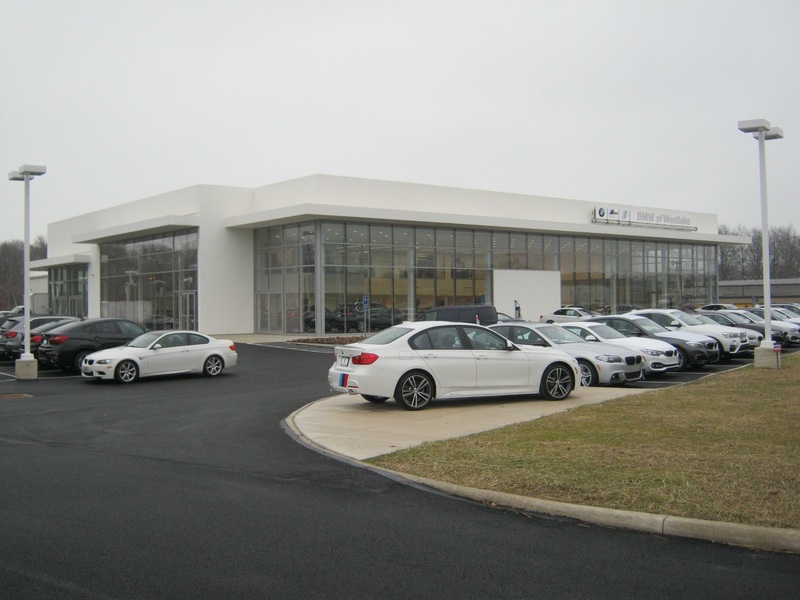 The former Ganley BMW facility in Middleburg Heights will continue to operate as a certified pre-owned facility that will also offer service and parts. It will become BMW of Westlake South and will serve as a companion dealership to the new facility in Westlake.